삼존목불좌상이 놓여져 있는데 이는 그 기법상 목불탱의 불보살과 똑같은 수법으로 만들어진 원각상(圓刻像)이라 하겠다. 본존상의 경우 육계가 생략되었고, 반달형의 중앙계주가 표현되었으며, 신체는 중후한 모습이지만 각 부분은 둥글게 처리되었다. 또한 통견의 불의는 그 두께가 두꺼워 신체 윤곽이 선명히 드러나지 않고 있으며 옷주름 또한 지극히 단순화되어 도식적인 느낌을 준다. 따라서 이 본존상이 목각탱과 동일한 작가에 의해 동시에 조성된 작품임이 확실하지만 목각탱에 비해 신체의 굴곡이 보다 유기적이고, 표현력도 뛰어나다. 이 작품들의 조성기(造成記)가 하단에 「康熙二十三年甲子季」라고 묵서(墨書)되어 있어 숙종(肅宗) 10년(1684)에 조성된 것이 분명하며 따라서 이들 조각은 17세기 후기의 조각양식을 알 수 있는 중요한 자료가 되므로 그 역사적 의의는 매우 높은 것이다. 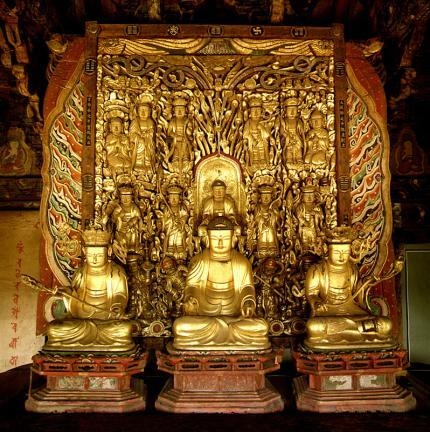 Placed before a wooden panel of a group of Buddhist icons carved in high relief in Daejangjeon Hall of Yongmunsa Temple, Yecheon, this wooden Buddhist triad shows Amitabha Budda flanked by two bodhisattvas. The principal Buddha has no usnisa (a protuberance symbolizing supreme wisdom) but features the semilunar “topknot jewel” on the front center of the head, and dignified appearance. The robe is rather thick and draped from both shoulders to cover the entire body except for the neck and the central portion of the breast, while creating folds depicted in a simple and stylized manner. 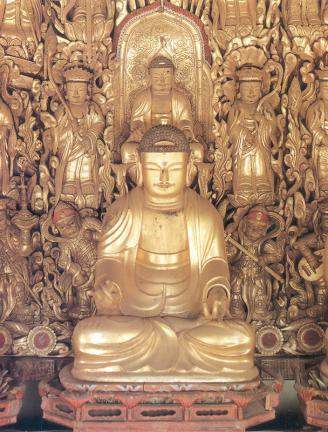 Details show that the Buddha and his attendants were made by the same artist who produced the altarpiece on the wall behind them although the masterly skills used for the depiction of the raised hands suggest that he was more attentive when carving the statues. 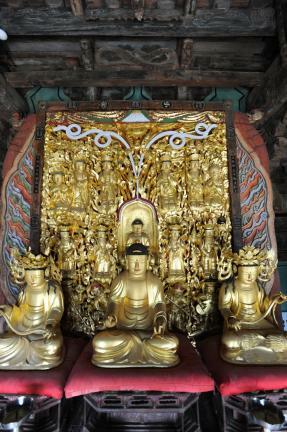 According to a postscript written on the lower part of the principal Buddha, the statues were carved in 1684 when Joseon was under the rule of King Sukjong (1674-1720). 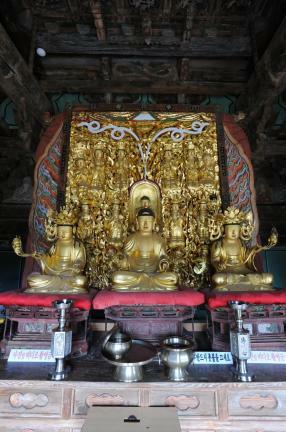 They are now generally regarded as a fine example of the Korean Buddhist sculpture in the late 17th century.